The Saf-T-Log HACCP Recording Thermometer represents total innovation from ETI. 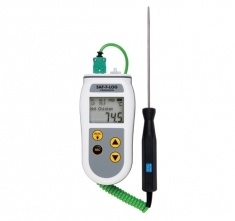 No other handheld temperature recording system records data this intuitively at anywhere near the price! The Saf-T-Log includes Windows® desktop software to create your list of up to 100 items that you routinely measure along with up to 25 users on your team. Each item can include a high and low limit that gives the user instant on-screen PASS/FAIL feedback and gets printed on the report. Once your checklist is created, it can be saved, emailed to other users, and loaded onto any handheld device. To record readings, simply scroll to the correct item and press record. Once readings are taken in the field they are downloaded to the PC automatically when reconnected. The data is archived and a report is generated automatically with no additional user input. It's that easy! The Saf-T-Log report is locked so data that is logged cannot be tampered with.